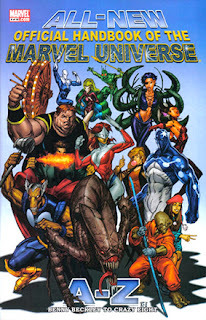 the Celestials, Chamber, the Collector and more! While the Handbooks of the past two years focused on specific themes, this twelve-issue monthly series will extend the coverage to all Marvel's characters, teams, objects, events, and places - plus past, future and alternate Earths. The spotlight will fall on more than 600 profiles -including new characters, characters who never received a profile and those needing major updates. Written by JEFF CHRISTIANSEN, ERIC J. MOREELS, MICHAEL HOSKIN, SEAN MCQUAID, RONALD BYRD, STUART VANDAL, MIKE FICHERA, MARK O'ENGLISH, MADISON CARTER, CHRIS BIGGS & BARRY REESE. Cover by KEU CHA.